What has it been like to share the limelight with the men’s team as both teams are playing well at the same time? Summer, you had to sit for the first nine games of the season. How difficult was that for you? You still practiced, but how did you remain focused and what was your mindset when you did get to take the court again? How is the day before the game this year different from the day before the game last year? What’s the feel of the team, what’s the vibe? With last year’s tournament run and experience, how do you rely on that today? Do you rely on that today? Dillard—“Same thing. You can’t really compare the two teams. 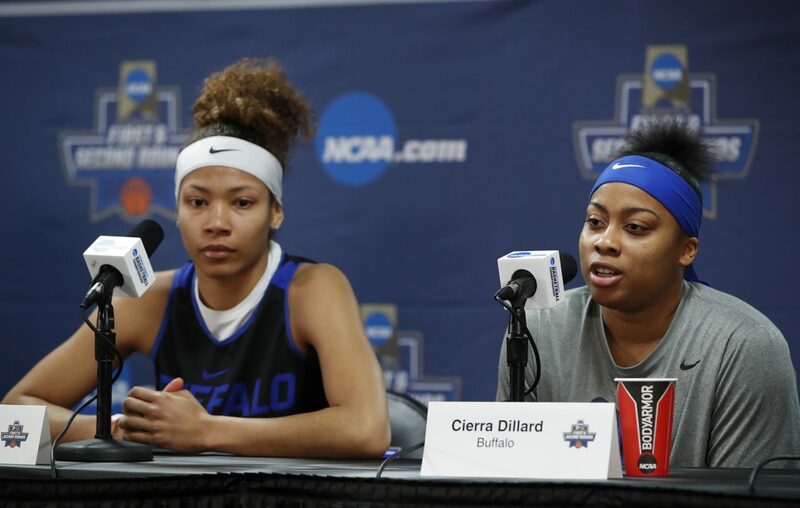 Coach Jack graduated one of the highest production classes in women’s basketball history at Buffalo; the highest points, rebounds, minutes, those five seniors really trail blazed the program. You are looking at two of the players that played a lot during that NCAA tournament; a lot of this is new for our underclassmen and some of our upperclassmen as well. You were shown in the MAC tournament that they’re not afraid of the limelight, they really aren’t. They aren’t afraid of the big stage, they just want to play. That’s what you want as a team from your underclassmen, you just want some dogs that wanna play for their sisters and give it their all on every possession. When you have a coach like Coach Jack, you have that passionate coach that fires you up, you have no choice but to play and give it your all because she does it on the daily. With Summer and I kind of leading the way as far as experience, we are letting them know that it’s okay to have nerves. It’s a big stage, but it’s another game…that’s all it really is. Just locking in with defense, your focus, offense, and what the coaches tell you and leadership…you just go out there and hoop. We will handle the thinking part for you, if you just go out there and hoop, enjoy the moment. Coach was telling some funny stories about the freshmen, have they been fun to get to know? Dillard—“Man, do you have to put me on the spot like this [laughing]. Have they been fun? They have been more than fun, and that’s what I like about Coach Jack. She just loves personalities and she definitely got seven different totally different personalities. They all bring something different to the table, let’s not get it confused. They are great talents, they want to get better and learn. They just don’t understand that the process of learning at the college level takes longer than they expect. I think that’s the biggest thing, but you want that energy. You want to have those underclassmen that have that energy, but you are just like slow down it is going to take a while. They just want to exuberate their energy and talents at a high level to help the team, and that’s what we love. But they are characters, they really are. They love to have fun. Last year, Coach Jack doesn’t do anything very different each year but she does like to have fun. And that is who we are; we are a blue-collar mentality type team. We bring our lunchboxes to work, as Coach Jack would like to say. Coach Jack reminds us that we are kids, we are 18-23 years old and that these are the most prized years of your life. When you get out in the real world and grow up, there is nothing like it. There are times where we are singing on the bus, I mean Coach Jack wakes us up at 3 a.m. to wake us up singing on the bus. We do silly string, we just love to have fun and enjoy the moment. We just love to be with our sisters another day and I think that’s why winning the MAC championship was so special. We had the relief of not having to wait for the at-large bid; we knew we had another week with our sisters. We have more memories to put into our lives of each other and we get to enjoy the extra time that we have together because we aren’t going to get this back. If you look at Coach Jack’s Twitter, we are dancing on the airplane and singing on the plane. They are a great group of kids, they extra.